KRing is a site featuring Flash animations and MP3 clips amongst other things. 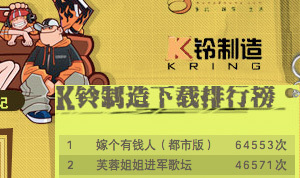 It’s top download, besting the irony-laced FuRong JieJie MTV (blogged here) is a an MP3 clip entitled 嫁个有钱人 (都市版) [Marrying A Rich Person (City Version)]. The clip is a short comedic piece detailing a person’s requirements for a rich spouse. In this City Version, requirements include “a mansion, the type with a swimming pool” as well as cars and a guaranteed comfortable lifestyle. There is also a 乡村版 [Country Village Version] and a 宝宝版 [Cutie Version]. Previous post The Staged Demise of Fringe Blogs?